Most remember Dustin Hoffman for his role in classics like Rain Man but Midnight Cowboy could his most distinctive role yet. When Jon Voight’s naive cowboy first meets the con-man in a dingy bar, you would be forgiven for not even recognising that it’s Dustin Hoffman at all. In fact, first glances it looks like a young Al Pacino. The role is like nothing Hoffman has ever played, cagey, slimy, disgusting and completely void of any redeeming characteristics. His skin is tinged dirty-brown and his teeth disgusting. Considering this was only two years after The Graduate, Hoffman’s “Ratso” couldn’t be further from Benjamin Braddock. It is when Hoffman is introduced that the film’s real direction emerges too. 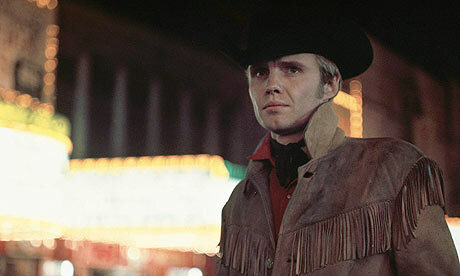 Until we meet his character our focus is primarily on the titular Midnight Cowboy and it is bizarre to see Voight play a character so young and naive. He is usually associated with authority figures and older, establishment men but here he is out-of-his-depth, wide-eyed and running into trouble. It is to Voight’s credit that you want him to do well. The great use of “Everyone’s Talking” by Nilsson, accompanying his enthusiastic bus-ride before the harsh world of New York hits him, is one of the subtle traits the film demonstrates. It is engaging from the beginning but it is when Voight truly “falls-in” with Hoffman that the movie takes the dark turn away from the initial, upbeat tempo. To director John Schlesinger’s credit, he builds the cold, harsh world of the “homeless” Ratso and his new cowboy tenant very well. You feel the freezing environment, the awful beds that they are forced to sleep on and the disgusting food they are eating. Add to this the hopeless, dreamers schemes that the two have to make money. It is to the credit of both characters that you want them to succeed in their desperate attempts to make some cash and improve their lives. The fact that you even start to feel a little for the ever-increasingly weak Hoffman shows how well he plays such an initially revolting character. It is a shame then that the movie takes a few strange turns towards the final act. There are dream sequences which don’t quite hit their intended impact and only work to remove the audience from the story. Add to that the weird party that the two attend, where at least ten to fifteen minutes of an already lean runtime are spent in this strange environment which doesn’t seem to work with the rest of what the film is about. The final act manages to pull it around though and although it is quite predictable, it feels like the fitting resolution to the movie and the two character’s stories. Overall, Midnight Cowboy manages to take two actors and cast them in roles which feel against their “type.”Hoffman couldn’t feel less like the Rain Man as the con-man Ratso while seeing Voight play young and naive takes some getting used to. Both do a great job though and in the harsh, cold and cruel New York environment, deliver a stark and interesting story. Next Next post: Should the Deadpool sequel be Deadpool vs Wolverine?